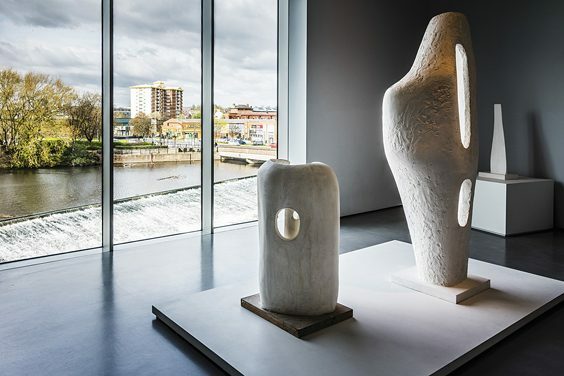 The catalyst for this iconic gallery was the offer in 1997 from the trustees of the Hepworth estate to Wakefield Council of Barbra Hepworth’s original plaster sculptures, a unique collection of forty works found in her St Ive’s studio after her death in 1975. The Guardian’s obituary described her as ‘probably the most significant woman artist in the history of art to this day’, a high accolade for a girl from Wakefield who, with Henry Moore, became the most significant British sculptors of the twentieth century. The gift was dependent on the sculptures being displayed in a suitable ‘building of architectural distinction and museum quality’. From 1923 Wakefield Council had the foresight to collect the work of British artists including Hepworth, but these were inadequately displayed in a converted Victorian house on Wentworth Street. This was an opporunity too good to miss and gained sufficient political and financial support to encourage a feasibility study in 2000. A site on Wakefield’s South Bank was secured for the new gallery. David Chiperfield Architects were the winners of the architectural competition held in 2003, carefully formulating spaces around the collection to be exhibited. This was conceived not as a single imposing building but more from inside-out, fulfilling his idea of ‘purpose’, explaining ‘that both the interior space and exterior volume have always been conceived as an integrated idea … and how you walk through it … and experience it’. 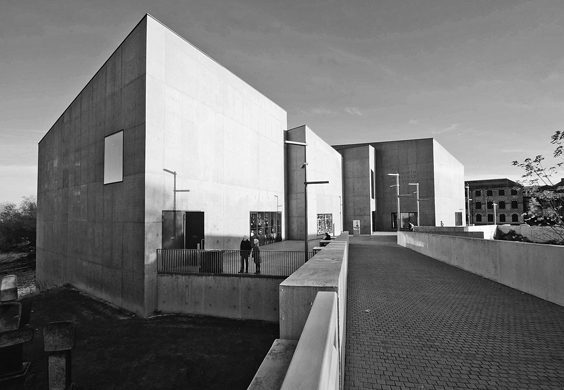 The Hepworth Wakefield is formed from ten individual galleries comprising of a series of interconnected volumes within differing cast-concrete boxes with mono-pitched roofs and concealed roof lights. The volumetrics of the solids and bulks was derived from the previous sheds on the site and the mills and warehouses on its dramatic riverside location on the edge of the Calder. It has been an outstanding success, with 2 million people from all over the world visiting the gallery to date. At its opening on 21 May 2011 Sir Nicholas Serota described it as ‘One of the most exciting and beautiful galleries in the United Kingdom’. The masterstroke is the footbridge over the river that gives it a unique sense of arrival.